Flying Lessons: Time Magazine takes on aviation. Time loses. 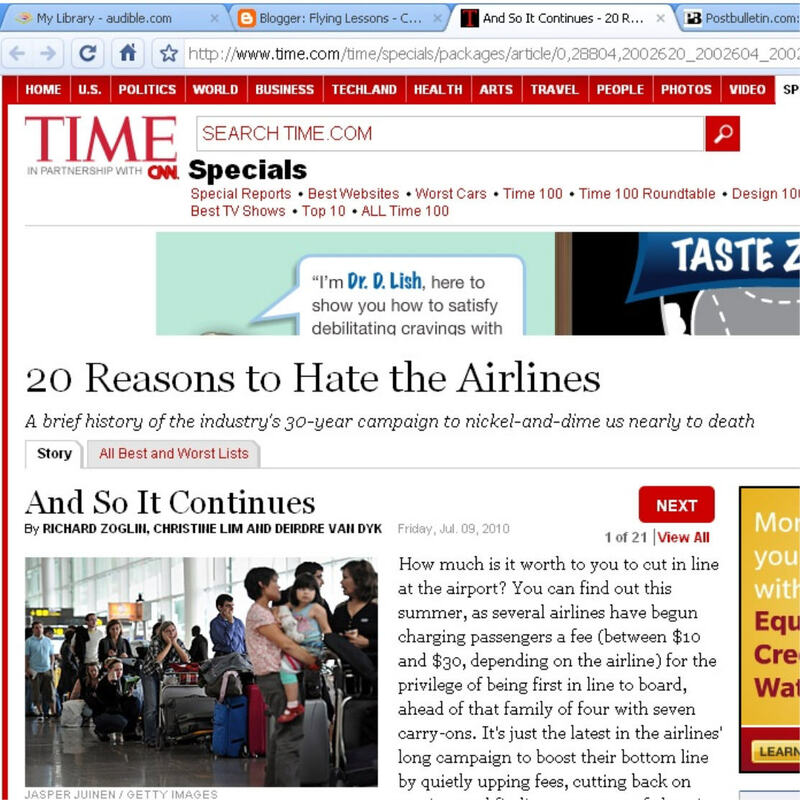 Time Magazine takes on aviation. Time loses. In a case of the pot calling the kettle black, journalism has taken on aviation in a remarkably ill-thought out article called 20 Reasons to Hate the Airlines. I read about this silly little piece of writing in Time from another aviation blog, Airline Nightmare. So I find myself once again in the odd position of defending commercial air transportation, a business I do not hesitate to criticize when deserved, but which in this case has a gotten a bum rap from Time. 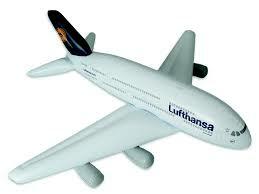 Point 1 – Time says the hub and spoke system has created airline monopolies that keep the price of airline tickets high. In fact, since the end of airline regulation, airline ticket prices have consistently dropped. Air travel has become more affordable as evidenced by the many hundreds-fold increase in the number of people who can afford to fly. What has become more expensive is the unrestricted airline ticket. Which takes us to point 2. Point 2 (and 16) - Non refundable fares. Like anyone who has hosted an event, knowing in advance how many people to expect is crucial. Airlines are no different. No-show passengers were great for those actually on the flight because there was more room in the overhead bins, and no one to fight with for the armrest. But flying empty seats was not so good for the airlines. It was wasteful; bad for business and bad for the environment. To discourage passengers from booking flights and then failing to show up at the gate, airlines started making no-shows pay. It worked. Now airlines are flying planes at 80-85% capacity. Point 4 – the disappearance of legroom. Okay, they’ve got me here. Point 5 – Frequent flyer gimmickry. Well as a loyalty incentive, frequent flyer programs were genius, nobody’s arguing that. And yes, Time , I’ll grant, it is plenty frustrating to have airline miles burning a hole in your suitcase with no way to use them except midnight, midweek, mid March flights to the Midwest. But still, there was a time when an airline ticket was bought with the expectation of getting from A to B and that was that. Now we feel like we deserve a prize for gracing the airlines with our presence. Point 6 – Lunch is NOT served. That’s right, very few airlines offer free food anymore on domestic flights Guess who started that trend? People Express. Food isn't free on Metro North, Amtrak or the Vamoose bus. Does anything illustrate the basic complaining nature of Americans more than decades of griping about bad airline food and then more griping when it goes away? Hey, Time, pack a sandwich, bring an apple. Get a life. Point 7 – No agents available. That’s right, to purchase a ticket, travelers will find its cheaper to do it themselves using these nifty gadgets called computers that have this even niftier thing called internet access. Seventy-six percent of Americans have it at home. (That's me on my computer and I'm wearing my wrap - see point 12) But you can also find it on your phone, or your iPad, or even the public library. Are there really folks out there who would prefer to spend 30 minutes going over flight time and dates with a reservations agent on the phone? Point 8 – The headsets for in-flight entertainment aren’t free. 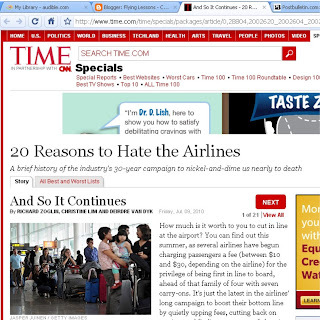 Please, Time, are you really telling us to hate the airlines over a $2 fee for a headset? Take the plugs out of your ears and listen to this tip. Buy the headset and you can keep it. Use it on future flights. Point 10 - Security line confiscation Ok, so if you bring shaving cream or a full bottle of water to the security line and it’s taken away from you because you live in a cave and didn’t know that shaving cream, water or any other large container of liquid is not allowed through security, then this is a reason to hate the airlines? Time, are you there? Security at airports is no longer an airline function. Did you miss the 2001 memo? Let me add, Time, and anyone else who didn't see it, that throwing away bottles at the security checkpoint is so passé. Carry the bottle through empty. Fill it on the other side. Those bottles don’t disappear from the earth just because you’ve dropped it (full no less) into a recycle container at the airport. For more on what you can do to reduce consumption of plastic, check out Beth Terry's amazing blog. Point 11 and 17 –bag fees. Okay, I was waiting for this one. I don’t like bag fees and I don’t know anybody else who does either. But take a breath and work with me here for just a minute. We’ve alluded to the difficult time airlines have had with air fares descending and fuel prices ascending. All those suitcases were flying at no charge, but that didn’t mean there was no cost. Of course there was. 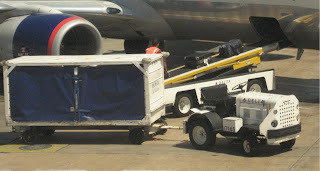 But now, people are actually traveling lighter, as I reported in The New York Times in April. Stephen McNamara of Ryanair told me, "We’ve tried to change passenger behavior by making it more expensive to bring bags." When it comes to doing the right thing, sometimes a little pinch in the pocketbook works wonders. Oh, by the way, People Express? They charged for bags back in the 1980s. Points 13 and 14 discuss the fact that first class, business class and economy class offer different amenities. You get a bigger, comfier, cushier seat when you buy a more expensive ticket. Yes. We know that. Point 15 - Drinks are still free. Time, did an editor even look at this feeble excuse for a feature story? Complaint 15 in the list of 20 reasons to hate the airlines is that US Airways once considered charging for soft drinks. Are drinks still free on airliners in the U.S.? Yes. So what is the gripe here? Point 18 - Surcharges on peak travel days. This is a new one on me, airlines tacking a fee onto busy travel days. It was always more expensive trying to fly around the holidays so I’m not sure what’s different. Point 19 – the cut in line charge. I think this refers to coach passengers who pay extra for priority boarding. I’m not sure how many airlines are actually doing this. But we all know that premium customers and frequent flyer status bestow priority in boarding. So does personal circumstances like handicaps or traveling with small children. I’ve traveled with small children, I appreciated the gesture. Point 20 – the toilet charge. Refer back to point 15 and the soft drink charge that wasn’t. The fee to pee belongs in the same category. Though this story swirls around like blue water in the bowl, Ryanair denies its planning to charge for passengers to use the toilet. And even if those wacky Irish executives do institute such a charge for the “loo”, does anyone seriously think an American carrier will try the same here? I think this article is phenomenally bad reporting, picking on aviation with a kind of thoughtlessness that's more embarrassing to the publication than to the industry. Airlines have their problems but you won't read any intelligent discussion of them in this article in Time. Thanks for pointing out the FACTS. Unfortunately for the airline industry, the public has been convinced to have unrealistic expectations to travel across the world - SAFELY - at ~500 miles per hour for on average, approximately ten cents per mile. You go, Christine! Great counter argument. I felt the same way when I read this article. Interesting thoughts which seem to suit only one side of the argument. The inefficiency of most airlines is unarguably the biggest contributor for their losses. Both articles seem to fail to recognize the inconvenience for passengers on overbooked flights. Regarding the 'free' drinks I refuse to drink from a cup which size reminds me of my last urine sample. Last but not least if U.S. airlines truly want to compete the Open Skies should go into effect and Europe's Ryanair (quoted in your article) or Easyjet should be able to offer a 9.99$ NY-DC or NY-Chicago flight with no booking fees, boarding categories or any other smart marketing concepts to charge more money. Conversely, I also wish that when they instituted the baggage checking fee, they also started policing how much crap people bring on. On short-haul flights and shorter trips, I carry on. But I have one carry-on bag that fits in the size template, and one camera bag or computer bag that qualifies as a "personal item." I really hate it when I follow the rules yet STILL can't get any overhead bin space because of a.) piggy self-entitled travelers who feel that they MUST bring on three or four bags that are way too big, and b.) gate agents and flight attendants who let them get away with it. But still, there was a time when an airline ticket was bought with the expectation of getting from A to B and that was that. Now we feel like we deserve a prize for gracing the airlines with our presence. No, the airlines freely offered up the mileage programs. That was their decision. We travelers took them up on it. Now is it cryingly unfair of us to ask the airlines to deliver what they promise? Great article! People just do not understand the difficult job we Low Cost airlines have. We are caring people who just want to get you from A to C, and often are roughly treated in the media for our efforts. I wouldn't mind paying to check a bag IF the airlines agreed to refund the fee in the event of problems or if they lose my bag. of problems or if they lose my bag.Well, Vidiot, Alaska Airlines does just that. Of course, if you Fly US Airways alot, you are probably on the East Coast and only a few cities there see Alaska Airlines service. Hi Christine - As a person who grew up in the industry and a 34 year employee now I actually agree with most of what you said. Times have changed and airlines are now just mass transportation and that's just the way it is. However you missed the point (and so did Time) on the disappearence of CUSTOMER SERVICE. It's all well and good to use the web when you are booking your initial seats but its when things go wrong that a good customer service agent can turn a bad situation into one you can at least live with. For example - one of my employee's was flying from DEN to ANC recently on UA and the flight cxld. UA told him the next flight available was the next day. What they failed to tell him was that AS had a trip leaving in 2 hours and they had plenty of seats. We found it by calling AS. US Airways actually did implement a charge for beverages for a short period of time. It wasn't just a concept, it was actually in place. Other than that, I agree with everything you said. That was a lame excuse for an article by Time. You are a good lobbyist for the aviation industry, but you forgot one essential things that airlines put themselves in that dire situation, airlines are trying to compensate their irresponsible pricing policy by charging all those ancillary costs.I wonder at the end of the credit card payment ( and adding all the extras )if fares dropped. Whoever commented on cheap fares NY-DC for 9.99 with Ryanair (no additional charges) must never have flown with them. Everything is charged extra... I got charged (8 USD/6 Eur) for not bringing any bags with me on a trip. Go figure on that one. The cost of the flight was 7.99 Eur. Yes cheap, but in the end I could've flown better by paying 20 Eur and not get slapped with all kinds of extras. Also, they make money through advertising from everything... and it is absoltely everywhere. I would like to see real transparency in the pricing... and clear advertising from airlines. This is the price for A-B and this is included... and this is your list of options... your choice if you want it or not. Airlines that put a low base far on to get a high ranking spot in search engines to slap you with higher fees later in the process are doing this consiously and that is bad marketing in the long run. Unfortunately it happens a lot. Most passengers have completely unrealistic expectations when they walk on board. And THAT is the problem and up to airlines to work on. Christine, BEAUTIFUL is what I have to say on ALL your points on this one! On Point 1 - VERY true, no one seems to remember that in 1979 you could go anywhere for under $200, & 30 years later they still want a RT fare for the same price while (as you pointed out) fuel in 1980 was $1 and today its at $77 per barrel! WOW I guess inflation shouldn't apply to airline fares as well. Thanks for taking the time to post your comments; it was well received by many of us that travel frequently 'enough' to understand the big differences in air travel from the days before deregulation and Peoples Express. 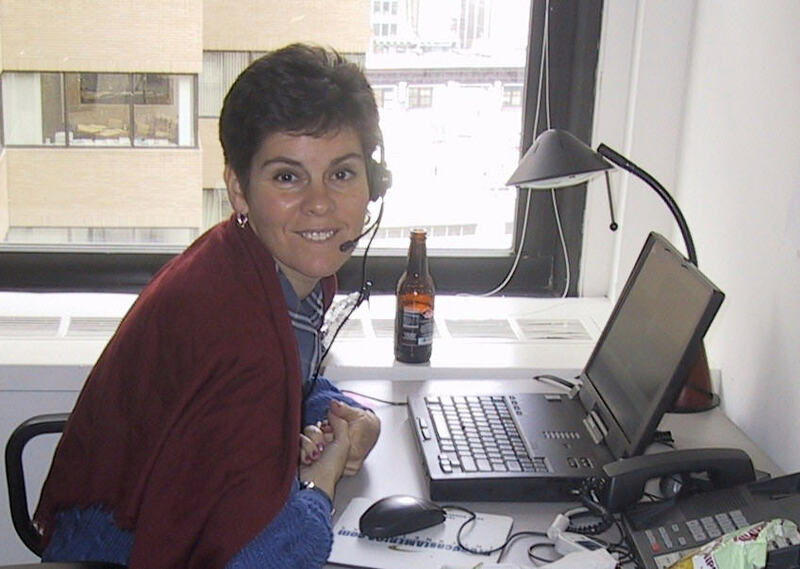 As an aviation analyst and writer, I have observed and worked in the industry for over 40 years. I agree with much of what you say in terms of unrealistic customer expectations but there are two considerations you have missed. The first is that since 9/11 we have seen airlines removing and/or charging for things that used to be included. No industry goes unscathed when they eliminate things that were previously included. And in the process they have done little to make the customer sympathetic to the airlines' needs. The other has already been alluded to--the demise of customer service. 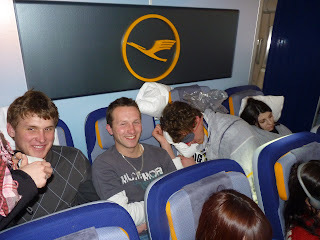 Along with meals and pillows, smiles and a positive attitude have also disappeared on many flights. While many employees have taken a beating over the past decade, that is not my fault and the fact that they are annoyed or angry should not extend to the cabin. Indifference should never be included in the fare. Ron, you are absolutely correct. See my previous post on this subject. And as for your final line, I wish I'd written it. 20 people could come up with a reason to hate Time Magazine and we could consolidate it into an article entitled "20 Reasons to Hate Time Magazine." Check out Allegiant Air. They charge for everything including $2.00 for a bottle of water. They charge for "priority" boarding. If you don't pay, you can't check in ahead of time on line. Plus they don't seem to have the DOT and FAA oversight that demands all their fees are clearly stated up front on their web site. I don't say hate them, but they do many of these things and their customers don't seem to care. What's up with that? Well said, Airlines are no angels but they are not a bad lot of people.I have been working in this industry for more than 30+ years and eventhough some airlines go overboard the industry as a whole tries to provide its passengers the best service they can and I emphasize "tries"
"Air travel has become more affordable as evidenced by the many hundreds-fold increase in the number of people who can afford to fly." This is of course is totally untrue. I spent literally 10 minutes on the internet comparing prices in the USA and Europe using Expedia and easyjet.com with Washington DC to Atlanta and London to Milan round trips as a comparison. I went a few weeks into the future and used the same dates for both trips (Aug 1 out, Aug 5 back). The r/t fare on Expedia (DC-Atl) was $592. This is for a trip that I can drive easily in a day. By comparison the fare from London Gatwick to Milan and back is the equivalent of $234. In other words I can fly between two of the loveliest cities in Europe and back for less than the cost of a one way ticket to Atlanta from Washington DC (two decidedly unlovely cities). In fact these weren't even the cheapest flights in Europe, and I found a fare from Milan back to London for LESS than $70 if I just wanted to change my plans and fly into Luton instead of Gatwick. Try finding a trip anywhere in the USA between two points for under $70. Its about time we got rid of this myth that airline travel in the USA is cheap or that deregulation somehow worked. When I buy an airline ticket in the USA I would be more comfortable if someone wore a mask and pointed a gun at me at the time of purchase to make the daylight robbery more acceptable. Airline travel in this country is not cheap, not comfortable and definitely not a pleasant experience. It's time more people were made aware of the rock bottom cost of airline travel in Europe and demanded the same pricing structure here.